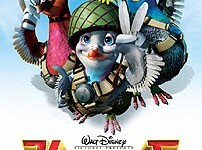 From the producer of "Shrek" and "Shrek 2," comes this high-flying computer-animated comedy-adventure tale of a brave-but-undersized pigeon named Valiant (voiced by Ewan McGregor), who dreams of joining the elite Royal Homing Pigeon Service (RHPS), and serving crown and country during World War II. Despite his small stature, Valiant's ambitions are enormous as he keeps a stiff upper beak and endures rigorous training in preparation for a dangerous mission to deliver vital messages to troops behind enemy lines. With a shortage of wingpower in the royal fleet due to increased attacks by a brigade of vicious enemy falcons (led by the ruthless General Von Talon), the mission falls to Valiant and the unlikely heroes of "Squad F" to try and save the day. With a wing and a prayer, Valiant and his fine feathered pals fly into harm's way and prove that it's not the size of the wingspan that counts, but the size of the spirit. Filled with adventure, comedy and memorable characters, "Valiant" delivers great entertainment for audiences of all ages. John Cleese, Tim Curry, Jim Broadbent, and an all-star vocal cast of British favorites also add to the fun and excitement of this imaginative feature. 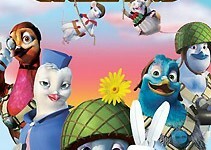 The film was inspired by the fact that pigeons saved thousands of lives during the war, and 31 of the 53 top honors given to animal heroes went to pigeons.